Do we want people to believe that BPD is a real psychiatric illness that they must manage for the rest of their lives, or do we want to promote a message of hope which says, “You can become free of your emotional distress and live the life that you want”? By presenting BPD as a severe mental illness which can be managed but not cured, the medical model of the BPD label utterly fails to promote hope. Additionally, the medicalized concept of BPD is scientifically broken: It does not describe a valid illness which is consistent across a population. Why do we keep using BPD if there is so much wrong with it? Is it possible that we would be better off without BPD? And if BPD is should be abolished, what should replace it? This article addresses how to replace BPD. To this question, my first answer is “Nothing” – that we should simply abolish BPD – and my second answer is “Emotional Dysregulation Susceptibility Syndrome”, which I will explore as a hopeful alternative. Let’s discuss these options. While I prefer to understand people without labels, due to practical considerations I contend that BPD should be replaced by a more hopeful label. This new label should refute the myth of BPD as a life-long mental illness and emphasize vulnerability to stress along a continuum. My position against BPD directly opposes the thinking of many in the psychiatric establishment, including large organizations like TARA BPD, the Treatment and Research Advancements Association for BPD, and NEA BPD, the National Education Alliance for BPD. TARA and NEA assert that BPD is a “serious psychiatric illness”, one which they can reliably investigate and for which they will create improved treatments. In my opinion, these medicalized viewpoints represent poor research and outright misinformation. Let me list and critique some of National Education Alliance BPD’s main positions. I hope the reader will sense how badly NEA’s claims on BPD, which often border on outright lies, fail to meet the criteria for good science and basic common sense. 1) BPD is an “illness”. NEA’s position: BPD is a single illness which causes unstable mood and behavior. Edward’s response: BPD is not one unitary entity that causes anything. BPD is not a single illness because the symptom-cluster that supposedly represents BPD cannot be reliably identified by any biomarkers (genes, brain scans, etc.) nor reliably identified by different psychiatrists across a population, as the NIMH recently admitted. The way a person understands their world based on past experience leads to unstable mood and behavior. 2) Genes are involved in causing BPD. NEA’s Position: Scientists generally agree that genetic and environmental influences are likely to be involved in causing BPD. Edward’s response: This is misleading on so many levels it’s hard to know where to start. Again, BPD is not one reliable entity. And there is no evidence that genes “cause” any of the distress-experiences denoted by the BPD misnomer – such thinking involves the mistaken assumptions that genetic and environmental factors work as separable influences in a quantifiable manner. I have written about these distortions extensively in my article on twin studies (#4). 3) Brain scans provide evidence that biological factors cause BPD. NEA’s position: There is evidence that biology is a factor in causing BPD, due to imaging studies in people with BPD showing abnormalities in brain structure and function. Edward’s response: Does NEA think the public cannot understand basic cause and effect? Of course seriously distressed people have observably different brains than “normals”. That doesn’t mean biology or genes cause these differences; neglect, abuse, and lack of love, which are much more prevalent in those labeled “borderline”, inevitably lead to different brain functioning. But that doesn’t even mean those things cause BPD or that BPD is real. Never take a difference for an illness. 4) Biological factors make people more likely to develop BPD. NEA’s position: The current theory is that some people are more likely to develop BPD due to their biology or genetics and harmful childhood experiences can further increase the risk. 5) The prevalance of BPD can be quantified. Edward’s response: Does anyone really believe that a subjective, descriptive label with no biomarkers can have its prevalence reliably identified to a tenth of a percentile? 6) BPD is a life-long mental illness. Edward’s response: This is one of the most damaging myths being promoted about BPD. Problems that are mislabeled BPD can be fully recovered from; people who once approximated borderline criteria can eventually live a satisfying, emotionally normal life. Many thousands of people have already done so. Getting better is hard work, but people do not have to cope with and manage BPD for life. People need real hope, not the discouraging prospect of a life-long illness. As can be seen, NEA BPD set themselves up as the experts on how to define and treat the BPD “illness”, an illness label they obviously intend to keep. But they may not have considered that former “borderlines” can see through their propaganda. Severely distressed people do not have accept the label BPD as an identity nor as an explanation for their problems. Emotional problems are not reducible to “psychiatric illnesses”, nor are they the exclusive province of psychiatry. Effective help which often leads to full recovery from problems mislabeled BPD already exists. Recovering does not require the assistance of “experts on BPD”, nor does it require DBT and medications, although these can help. Also, people can have their own definition of recovery and a meaningful life. Emotional problems mislabeled BPD can be completely healed and do not have to be managed for life. It’s time to say goodbye to National Education Alliance’s harmful theories about BPD as a life-long psychiatric illness, to end the borrowed time these theories have been living on. I also oppose the message of blogs that attempt to put a positive spin on BPD, like “Make BPD Stigma Free”. In my opinion, reducing BPD’s stigma and building “BPD Pride” is doomed to failure. To me, these efforts resemble shifting deck chairs around on the Titanic. Similar attempts to reduce depression’s and schizophrenia’s stigma have foundered miserably; the problem is that reducing complex emotional issues to medical labels explains nothing and fails to empower people. “Defeat Depression”, a large scale British campaign to reduce the stigma of Major Depressive Disorder, failed to reduce stigma and did not improve outcomes according multiple follow-up studies. “Beyond Blue”, an Australian attempt to reduce the stigma of so-called mental illnesses, also backfired. Studies investigating its effect found that those who knew less about mental illness diagnoses, or who were given a diagnosis but rejected it, had better outcomes than similar people who believed they “had a mental illness.” This unsettling finding has been confirmed in John Read’s research (e.g. Models of Madness). If Defeat Depression and Beyond Blue failed to destigmatize depression, why should a destigmatization program for BPD succeed? Alongside “schizophrenia”, BPD is the most unreliable, invalid, confusing, harmful, stigmatized, and useless label. Even if BPD were to lose its stigma, it would remain an unreliable term that explains nothing about an individual’s problems. 1) No More BPD Diagnoses: Distressed people would no longer receive the BPD label during hospitalizations or psychiatric consultations. They would be understood as individuals using the Formulation approach to distress (see article #19 here – https://bpdtransformation.wordpress.com/2014/12/04/19-hope-meaning-and-the-elimination-of-borderline-personality-disorder/). 2) Label-Free Treatment: Psychotherapists and treatment programs would help distressed people without viewing them as borderline, no matter how much the client “fit” that outdated term. 3) Label-Free Family Understanding: Families would be helped to support their distressed members without being fed the fiction that their loved one “has BPD.” Parents, siblings, partners, and children would find that their loved ones’s problems can be understood without calling them borderline. 4) A New Research Paradigm: into severe emotional problems would cease to be focused around BPD. It would instead use the emotional dysregulation spectrum concept that I’m going to discuss. There would be more qualitative, experience-focused research, and less quantitative label-focused research. 5) Abolition of BPD and the DSM: BPD would be abolished from the DSM, as it has already been removed from ICD (Europe’s version of the DSM, from which BPD was recently voted to be dropped). Furthermore, as an unscientific fraud full of fictional illnesses, the entire DSM would be eviscerated. In time, BPD would be viewed as an outdated relic, a sad symbol of an age where psychiatrists constructed bizarrely misguided labels for emotional distress. People in the year 2200 would look back on “BPD” in disbelief, much as people today look back at centuries-old conceptions of physical illnesses. BPD would be mocked alongside notions of evil spirits released by bloodletting and plagues caused by divine curses. A BPD-free world is possible. People often underestimate what can be done over long periods of time with sustained, gradual effort. Perhaps BPD’s life is already growing short. How Would We Understand People Without BPD? What a scary idea! How could we ever understand people showing “borderline” symptoms without labeling them with BPD?! How do we understand the problems of anyone we care about? 1) Listen to their story. Learn about what past and present experiences are causing their distress. Develop a shared understanding of their problems based on their history. 2) Learn about what they want to change in the future. Develop a shared understanding of their needs and dreame. 3) Understand fundamental human needs for security, dependence, respect, and independence. People labeled “borderline” can be effectively helped without labeling them as BPD. But because of the reductionist ideology that has crippled the minds of too many mental health “professionals”, abolishing BPD without a replacement label may be a bridge too far. The Big Pharma profit incentives which maintain the need for medicalization of emotional distress present another obstacle. Supported by the public’s ignorance about what a precariously perched house of cards “BPD” really is, the profit motives of psychiatrists and Big Pharma will likely block a total abolition of BPD, even though BPD paradoxically never existed and does not exist today. Therefore, I suggest the intermediate step of renaming BPD, something which has already begun to happen for other pseudo-illnesses such as “schizophrenia”. 1) Undermine the false conceptualization of emotional distress as an illness that is consistent from person to person. 2) Emphasize that emotional distress varies along a continuum and that people labeled “X” are not always “X” (i.e. are not always distressed, but are vulnerable to stress). 3) Reduce stigma by introducing a fresh name without negative connotations. Despite these hopeful goals, one might argue that replacing BPD with another name would lead to just as much stigma and misunderstanding. But could a new name truly aspire to be as miserably uninformative as Borderline Personality Disorder? Would BPD by any other name smell just as bad? (Yes, there really are no more “schizophrenics” in Japan. They have a new, less-stigmatizing name for psychotic distress, meaning “integration syndrome” in Japanese, and people undergoing psychotic episodes are no longer called schizophrenic. The entire Japanese government-recording and psychiatric-labeling system for psychosis has been changed. See here – http://www.schres-journal.com/article/S0920-9964(09)00140-6/abstract ). Van Os renames schizophrenia, “Psychosis Susceptibility Syndrome” , or PSS. The name implies that psychotic experience occurs along a spectrum of severity, involves vulnerability to environmental stress, and that people who have been psychotic in the past are not always psychotic today. In this model, “schizophrenia” as a discrete illness is meaningless and false. Taking Van Os’s lead, I suggest replacing Borderline Personality Disorder with “Emotional Dysregulation Susceptibility Syndrome”, or EDSS. 1) Spectrum, Not Illness: EDSS represents a spectrum or continuum of increasing vulnerability to emotional distress. Despite similar appearances, people vary along this spectrum both in degree and kind of distress experienced. People would have more or less “EDSS” in relation to others and themselves at different times. EDSS is therefore not one illness, but a spectrum of related conditions – it refutes the misrepresentation of BPD as an internally reliable illness. 2) Vulnerability, Not Illness: EDSS represents a heightened susceptibility or proneness to emotional distress, usually correlated with neglect and abuse in childhood. EDSS itself does not cause distressing symptoms; rather, it represents the heightened likelihood of environmental stress causing these distress experiences. Compared to BPD, EDSS gives more weight to what happens around a person, rather than to isolated non-contextual internal experiences. EDSS is a syndrome – again meaning it represents similar-appearing experiences which do not necessarily reflect a consistent underlying illness. 3) Recovery and Freedom, Not Management: EDSS represents a psychological state that someone can be in at a certain time of their life, but can grow out of and be free from at a later time. It is in no way a lifelong condition. With effective help, people have a good chance of moving out of the EDSS spectrum for good. This refutes one of the most damaging lies about BPD: That BPD is a life-long illness. The deficit of all-good images leads to the inability to comfort oneself when under stress (i.e. emotional dysregulation), and to the increased susceptibility to stress relative to most emotionally-healthy people who had more consistent past and present support. All the other distress experiences commonly labeled “borderline” – e.g. destructive acting out, lack of identity, rapidly shifting moods, extreme rage, splitting, etc. – would be understandable results of having to cope with the missing self-comforting functions that can only be provided by a predominance of good self/other images over bad self/other images, i.e. enough good experiences in one’s past to reassure oneself when under present-day stress. These distress experiences would also be understood as present-day replayings of past trauma; i.e. as the projection of the all-bad self-object images internalized in childhood onto others in the present, which make the person experiencing EDSS feel that they are “bad” and others are rejecting or unavailable. These descriptions do not represent an illness, but rather a dynamic state of relating to oneself and others at a certain time. One can function at any point along the spectrum from almost Non-EDSS to very severe EDSS – i.e. from approaching a normal range of being able to comfort oneself and function well, with only occasional regressions into serious distress – down all the way to very severe EDSS, in which the distress experiences are constant and severe to the point that normal functioning is not possible. Hopefully that the paradigmatic differences between BPD and EDSS are clear. I hope these ideas will be encouraging and provoke thought about whether BPD really is valid and useful. Replacing BPD might seem unthinkable now, but there were times when women voting seemed impossible, when black people being free seemed impossible, and when tobacco causing health problems seemed impossible. Radical change can happen. Often, the process leading to a dramatic change is gradual and unseen, like when decades-long pressure building under the Earth’s crust goes unnoticed before an earthquake. If a small but growing number of people reject the BPD label, this process can build momentum toward renaming and/or abolishing BPD. I encourage everyone reading this who has ever been labeled “borderline” to consider that you no longer have to identify with or accept BPD, period. “The BPD label you’ve called me is a simplistic checklist of distress factors, factors which anyone under stress for long enough can experience to different degrees. There are no reliable genes, brain-scans, or other biomarkers which can identify so-called BPD. In fact, BPD is in no way a reliable classification; it is an “illness” fabricated out of thin air without a basis in real science. Psychiatrists and therapists need to hear this from more of the people they call “borderline”! This entry was posted in Uncategorized and tagged abuse recovery, borderline healing, borderline hope, borderline personality, borderline personality disorder, borderline personality disorder causes, borderline personality disorder cure, borderline personality disorder recovery, borderline personality disorder stories, borderline personality disorder therapy, borderline personality disorder treatment, BPD, bpd cure, BPD diagnosis, BPD explained, BPD forum, BPD genes, bpd healing, bpd hope, bpd recovery, bpd therapy, bpd treatment, Diagnostic and Statistical Manual, dialectical behavior therapy, DSM, Emotional Dysregulation, hereditary BPD, hope, hope for borderline personality disorder, mental health, narcissistic personality disorder, npd, Psychiatric Labeling, recovery, schizophrenia, trauma, victims of abuse on June 26, 2015 by bpdtransformation. These statements are absolutely false. Yet these myths continue to appear online, often being communicated to people recently diagnosed. As the studies below demonstrate, most people diagnosed with BPD do want help, most will stay in good treatment, and most do recover to different degrees. Highlights: Led by Josephine Giesen at Maastricht University, Dutch researchers treated 88 borderline patients for three years with twice-weekly psychotherapy. Patients were randomly assigned to either Schema-Focused Therapy or Transference-Focused Psychotherapy, which are described in detail below. After three years, a large majority of patients showed significant improvement, with many considered fully recovered and no longer diagnosable as borderline. In the group of 45 patients undergoing Schema-Focused therapy, more than half were no longer diagnosable as borderline after three years, and many more had improved significantly. Patient Population: 88 Dutch patients diagnosed with BPD. Average age around 30 years, with most patients in their 20s or 30s. Over 90% of patients were female. The group had average educational levels for Holland; about half had attended some college or completed a degree. As for functioning before treatment, around 50% were on state disability, 20% were working, and the remainder were students or stay-at-home wives/mothers. Trauma in Patients’ Histories: Over 85% of the patients reported childhood physical abuse. About 90% reported childhood emotional abuse or neglect. More than 60% also reported sexual abuse. Over half the patients had seriously contemplated or attempted suicide within three months before treatment. About three-quarters were taking some type of psychiatric medication. Intervention: For a three-year period, patients attended two 50-minute sessions per week of either Schema-Focused Therapy (SFT) or Transference-Focused Psychotherapy (TFP). Treatment occurred at outpatient medical centers in four Dutch cities. The type of therapy given was randomized. Definition of Schema-Focused Therapy: SFT is a psychodynamic treatment which assumes the existence of schemas (mental models of relationships) expressed in pervasive patterns of thinking, feeling, and behaving. The distinguished modes in BPD are detached protector, punitive parent, abandoned/abused child, and angry/impulsive child. Change is achieved through a range of behavioral, cognitive, and experiential techniques that focus on (1) the therapeutic relationship, (2) daily life outside therapy and (3) past traumatic experiences. 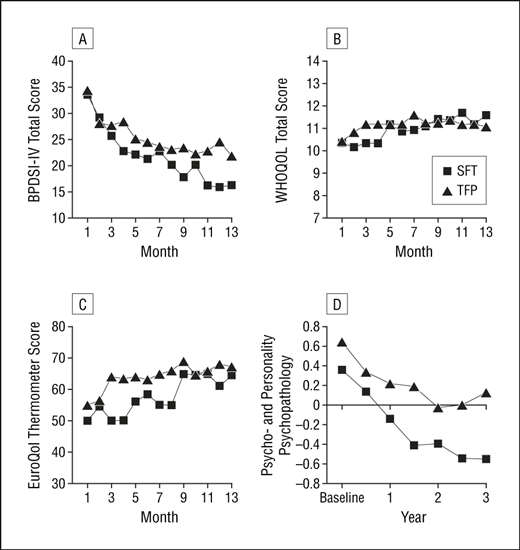 Recovery in SFT is achieved when dysfunctional schemas no longer control the patient’s life. Definition of Transference-Focused Therapy: TFP is a psychoanalytically-derived therapy which focuses on the transference relationship between patient and therapist. Prominent techniques are exploration, confrontation, and interpretation. Recovery in TFP is reached when good and bad representations of self and others are integrated and when fixed primitive internalized object relations are resolved. Therapist Composition: 44 different therapists treated the 88 patients. Over 90% of the therapists had doctoral or master’s level training. All therapists had previous treatment experience with BPD patients. Therapists averaged 10 years of experience working with borderline individuals. Outcome Measures: Patient progress was assessed every 3 months for 3 years. The primary outcome measure was the BPDSI-IV, a 70-item scale measuring the severity and frequency of borderline symptoms. Patients also completed regular quality-of-life questionnaires. These included the World Health Organization quality of life assessment, a 100-item questionnaire covering level of satisfaction with interpersonal relationships, level of independent functioning, psychological wellbeing, and physical health. Dropout Rate: Of 45 patients treated with Schema Therapy, only 11 dropped out during the entire 3-year period. So 75% of this group persevered in intensive therapy for at least three years. Of 43 patients treated with Transference-Focused Therapy, 18 dropped out during the 3-year period. However, the study notes that 10 of these 18 drop outs disliked the therapy method or their therapist, and 5 of 18 had issues around TFP’s method of enforcing contracts. Many of these dropouts occurred in the first few months. In my opinion, TFP is a more rigid, less effective form of treatment, and so it’s unsurprising that more patients dropped out. There’s no reason these patients couldn’t do better in another treatment. So how was improvement in these patients measured? To answer this, one has to understand the measures used in the study. The primary gauge was the BPDSI-IV scale, which was filled out by patients every three months for three years. The BPDSI consists of 70 items arranged in 9 subscales. For each of the 9 DSM symptoms, 7-8 questions are asked to determine how severe and frequent the behaviors/feelings have been over the past three months, from the patient’s perspective. Each question is rated on an 11-point scale, running from 0 (never, not at all, low) to 10 (daily, very intensely, high). For example, several questions would ask about the intensity/frequency of a patient’s feelings of emptiness (DSM BPD criteria #7), several questions would ask about the intensity/frequency of a patient’s suicidal thinking/behavior (DSM criteria #5), several questions would ask about how unstable or intense the patient feels their relationships to be (criteria #2), and so on. The scores relating to each symptom are then averaged, producing an overall rating for that symptom. (For example, the scores for all questions about emptiness would be averaged to produce one “emptiness score”, a number between 0 and 10.) These 9 average rating for the 9 symptoms (numbers between 0 and 10) are added up to give a “BPDSI-IV” score, which represents the severity of the patient’s borderline problems over the last three months. This number will be anywhere between 0 and 90, with 0 being perfect mental health and 90 being the severest borderline disorder. Although I dislike the BPD diagnosis, I don’t mind the method used in this study, because it involves asking the “borderline” patients how they feel. In other words, the BPDSI scale is not a judgment by clinicians, it’s a report from patients. 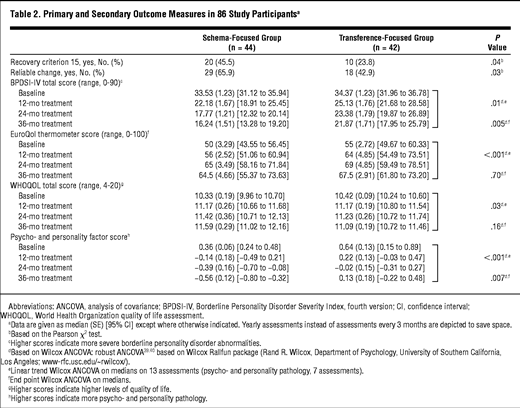 In the top left graph, we see that in the schema therapy group (line with squares), the patients started out at an average BPDSI rating of around 35 (out of 90, with 90 being the most severe, representing the worst rating for each of the 9 BPD symptoms), but this had dropped to almost 15 by the end of the first year. The patients in the transference therapy group also improved, but a little less so. The bottom left Euro-QOL scale is a measure of the patient’s subjective feeling of well-being on a scale from 0 to 100, with 100 being the best. We can see that it improved significantly for both patient groups over the first year. 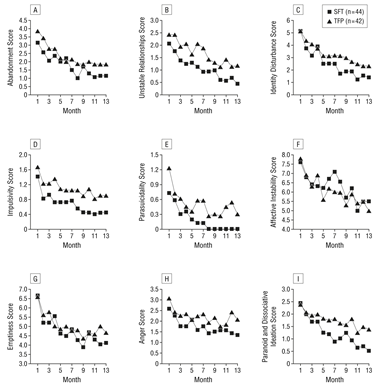 The left-hand numbers on each graph represent the average BPDSI rating for the group for that symptom. For example, for item C (top right), the “Identity Disturbance” rating (DSM symptom #3) started at an average of 5 out of a worst-possible rating of 10. This rating is an average for all the patients in the group. It then drops to an average of less than 2 out of 10 after the first year, an impressive reduction. Average group ratings over time for all 9 BPD symptoms can be seen. From the top left, the items are: Abandonment score, Unstable Relationships sore, Identity Disturbance, Impulsivity, Suicidality, Emotional Instability, Emptiness, Anger, and Paranoid/Dissociative Tendencies. All of these ratings are from the patients’ perspective. The reader can see that in every case the trend is positive (symptoms getting less intense and frequent). We can see that the patients improved a lot in the first two years, and tended to maintain that improvement between years two and three. I don’t interpret this pessimistically. After a significant period of early improvement, there is often a time where a person works to become more secure in their new level of functioning and relating. This may partly account for the “leveling off” of the scores between years two and three. If the patients continued in treatment (or on their own), they could improve further. After three years, at least half of the Schema therapy group’s patients had recovered to the point where they felt well enough to no longer be considered “borderline”, and more than two-thirds were considered highly improved. “Recovery” was defined in this study as achieving a BPDSI score of lower than 15 out of 90, and maintaining that level through the end of the study. Other patients who improved a lot (e.g. going from a BPDSI rating of 50+ down to 25 or 20) would only barely be diagnosable as borderline, even if they weren’t considered “fully recovered”. These studies tend to be very binary (e.g. people are either “recovered” or “not recovered”, but reality is not like that). It’s important to remember that improvement is a process; it’s never all or nothing! For Young, this study demonstrates that therapy for BPD can lead to full recovery, and that longer-term psychodynamic therapy can be very effective. However, his comment might be a little grandiose, as people with borderline symptoms made “deeper personality changes” long before he invented Schema Therapy. I am by no means an expert on Schema Therapy, and I have no affiliation with Dr. Young. My understanding is that SFT involves a mix of cognitive-behavioral and psychodynamic techniques. It focuses on building a positive therapeutic relationship, on better managing daily life, and on working through past traumatic experiences. These elements are common to most therapies. Schema therapy also contains an object-relations (psychoanalytic) foundation, in that it conceptualizes the borderline patient as using “schemas” in their mind to represent and relate to themselves and others. Examples of these are punishing parent and angry child, uncaring parent and abandoned child, etc. Schema therapy helps the borderline patient understand how these faulty models developed – often due to trauma and poor parenting – and to stop the replaying of negative past interactions from destroying the potential for new, better relationships in the present. In this sense, it is based on Fairbairn’s object relations model, discussed below. In the bigger picture, this study’s results are obvious. Intensive help helps people, just like the sky is blue and the sun rises in the east. “Borderlines” are no exception to this. If they can access effective support – and are given a reasonable sense of hope – people diagnosed with BPD will do very well. What we need to be doing is getting more people access to effective treatment, and leaving behind the outdated myths that BPD is untreatable or incurable. It’s amazing how such common sense escapes people who say, “borderlines don’t seek help, borderlines won’t stay in treatment, borderlines can’t be cured etc.” In my opinion, they are about as well-informed as people who think the Earth is flat. All of these studies show positive results. Again, this is not rocket science – good treatment helps people diagnosed with BPD! What If Borderlines Don’t Get Good Therapy? But what is people diagnosed with BPD don’t get good long-term psychotherapy? Do they inevitably do badly? Patient Population: 290 patients diagnosed with BPD, assessed at McLean Hospital in Massachusetts. They were first treated as inpatients during brief hospital stays. Method of Study: This was a longitudinal-observational study. The patients were interviewed every two years for at least 10 consecutive years, starting in the early 1990s. During interviews, their level of functioning in work/school, satisfaction with interpersonal relationships, and degree and frequency of borderline symptoms were measured. After 10 years, 90% of the original cohort of 290 patients were still participating. Therefore, this study followed the “natural course” of BPD. This medical-model idea is misleading (the notion that BPD has a “natural course”), but I won’t go into that now. 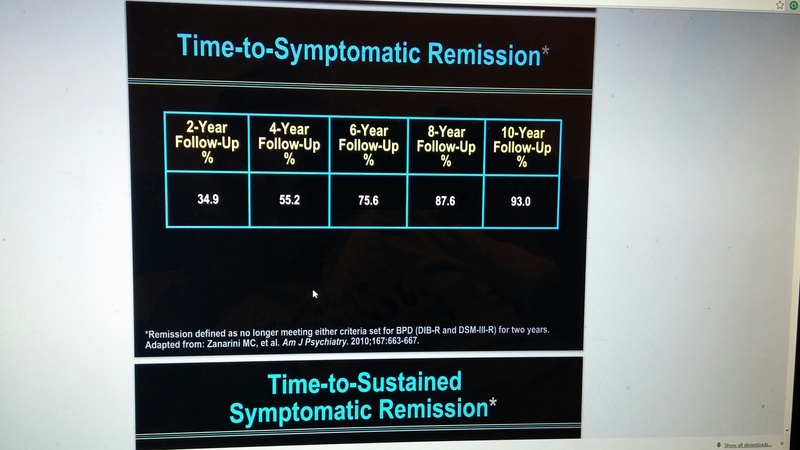 Suffice it to say that the researchers in this study did not “treat” the patients – they just followed them after hospitalization and went to great lengths to see how they were doing every two years. To me this last slide is questionable, as it’s not clear how “good work performance” was defined (and a certain period of work is not a prerequisite for “recovery”, anyway). Nevertheless, this study shows how, in a group of previously hospitalized borderlines, most people improve to the point where they are able to function in a job and have an intimate relationship. Again, the study authors provided these patients with no treatment beyond brief hospitalization, although many probably sought help on their own. There are many other ways to critique this study; for example, one could say it only applies to “borderlines” in the northeastern United States who went through McLean hospital. However, other studies following borderline patients for decades reach similar conclusions. These include Thomas McGlashan’s Chestnut Lodge study (Maryland, USA), Michael Stone’s “Fate of Borderline Patients” study (New York, USA), and Joel Paris’ longitudinal study of borderlines (Montreal, Canada). All of these studies concluded that a large majority of borderline patients improved significantly, and many recovered in the long term. Collectively these studies included over a thousand patients. These studies can be found by searching online, as well as through the books by McGlashan, Stone, and Paris on Amazon. The anti-psychiatry side of me says that these longitudinal studies reveal what a meaningless and unreliable diagnosis BPD is. It doesn’t make sense that some percentage of people are initially borderline, then at varying points in time they are suddenly no longer borderline, then a few of them are borderline again, and so on. Maybe BPD was never a valid illness to begin with. But such common sense seems to escape Harvard-educated researchers like Zanarini 🙂 Then again, to admit that what they’re studying is an unscientific fabrication wouldn’t be great for their careers, nor for receiving funding from the National Institute of Mental Health. Although these studies have flaws, I hope readers will see that people diagnosed with BPD do seek help, and that they can recover to be emotionally well and free of “borderline” symptoms. These are not just opinions. They’re facts. Lastly, it is important to understand that these studies – like most in psychology – are quasi-experimental. This means they are not perfectly controlled experiments, because when studying human beings many factors simply cannot be controlled. One can never study a person as reliably as one studies solar radiation or the molecular structure of uranium. These studies should also not be interpreted as applying to any particular person. Rather, they are averages of many different people’s outcomes, and only have meaning on a group level. Wow, I am exhausted thinking about all this data. Time to get a beer! If you are struggling with BPD yourself or are trying to help a borderline individual, I would be happy to listen to your story and provide feedback if possible. Feel free to provide constructive criticism of this site also. This article is the opinion of a non-professional layperson, and should not be taken as medical advice or as the view of a therapist who is professionally qualified to treat Borderline Personality Disorder or any other mental health condition. Readers should consult with a qualified mental health professional before undertaking any treatment. This entry was posted in Uncategorized and tagged abuse, abuse recovery, borderline healing, borderline hope, borderline personality, borderline personality disorder, borderline personality disorder causes, borderline personality disorder cure, Borderline personality disorder diagnosis, borderline personality disorder healing, borderline personality disorder recovery, borderline personality disorder stories, borderline personality disorder therapy, borderline personality disorder treatment, bpd cure, BPd demystified, BPD explained, bpd healing, bpd recovery, bpd treatment, dialectical behavior therapy, hope, hope for borderline personality disorder, love, mental health, mental illness, recovery, schema therapy, stigma, trauma, victims of abuse on February 13, 2015 by bpdtransformation.